If Scotland launch their Nations League campaign with victory over Albania, no-one will care about their run of friendly defeats, says Pat Nevin. The Scots have lost their last three games and four of the first five in Alex McLeish's second spell as manager. Their only goal - and victory - came in a 1-0 win in Hungary in March. "Big Alex has been up front about things and he knows it has not been a great start," former winger Nevin told BBC Scotland. "However - and it is a massive however - win tonight and it is all forgotten. "This is the first game that means anything at all. The other games… some have been embarrassing, some have been understandable, whatever. It doesn't matter. "Win tonight and we are off to a flyer and in with a chance of getting out of this group. If he does that, all these friendlies… who cares?" Winning their Nations League group, which also contains Israel, would give Scotland a chance of a place at Euro 2020 and a first major finals appearance in 22 years. But they suffered a demoralising 4-0 home defeat by World Cup semi-finalists Belgium on Friday, being caught in possession in the build-up to several of the visitors' goals. Nevin believes McLeish is "caught between a rock and a hard place" with the style he is trying to introduce to the side. "It was a thumping on Friday and it could have been so much worse," noted Nevin, who won 28 caps for his country. "I think the Belgians turned it off a bit for the last half-hour. "Do we go the same way and try to play the ball out from the back? Because that was part of the problem against players who were far too good for them. Two, arguably three, of the goals were caused by that. "Do we go back to something more simplistic? You can't go and play a long-ball game because you have got Leigh Griffiths up front and he is not the tallest. "Alex has got to get confidence and belief back into the squad. There are enough decent players there to take on Albania. Let's just hope that drubbing on Friday, and the way the game went, doesn't affect them for this one." 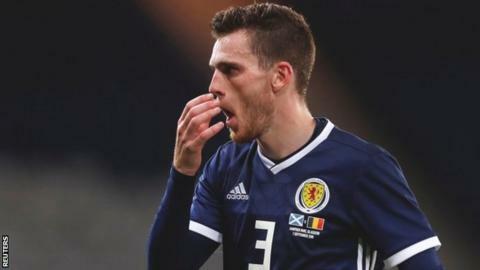 McLeish has admitted it is a "conundrum" how to accommodate both Liverpool's Andy Robertson - his captain - and Celtic's Kieran Tierney, also normally an attacking left-back, in his side. Gordon Strachan, his predecessor as Scotland boss, utilised Tierney at right-back, while McLeish used the 21-year-old on the left of a three-man central defence against Belgium. "I would look at it in a different way," added Nevin. "I think you need a back three. If you put a back two [centre-halves] out there, I don't know if it is good enough against the very best teams. "Now it might be good enough against Albania, we don't know. I have looked at their last few games and I have no idea who they are going to play tonight. They change it all the time. "They can be excellent, they can be poor. They have played Israel three times recently - a 3-0 win, a 3-0 loss, and a 1-0 win. So it is all over the place. "There are lots of tough choices for Alex but that is what he is paid for and he has got to get it right. "This can all be changed around very quickly. Alex knows that, and the players do too. Are we good enough to do it? That remains the question."